Lexington, Ky. - BloodHorse.com introduces a newly redesigned Auctions section on its award-winning Web site. Besides the latest news and statistics from all the Thoroughbred commercial markets, the improved Auctions section now features FREE access to the comprehensive BloodHorse.com Auctions Database. Leading Sires and Leading Broodmare Sires lists - Updated Daily! The FREE Auctions Database Search feature is located on the right hand side of the Auctions page on BloodHorse.com. Information on horses previously offered at auction by sire, by dam, by broodmare sire, covering sire or even a sire's sire is readily available. Visitors can also find results by sale or look up all the horses offered by a specific consignor or purchased by a particular buyer. In addition, information on all yearlings that sold between a specific range of prices during a given year is also available. Blood-Horse Publications is a multimedia publishing company that traces its roots to 1916. Its flagship publication, The Blood-Horse, is the leading weekly Thoroughbred racing and breeding news and information magazine. In addition, Blood-Horse Publications also publishes the award-winning The Horse: Your Guide To Equine Health Care, a monthly equine health care magazine; The Blood-Horse MarketWatch, a newsletter for Thoroughbred investors; the official Kentucky Derby and Breeders' Cup souvenir magazines; Auction Edge; and Keeneland magazine. 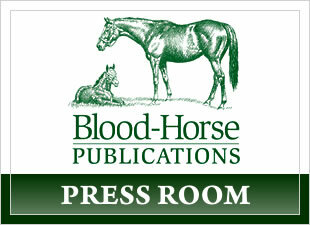 In addition, Blood-Horse Publications also publishes equine-related books and videos under the Eclipse Press banner, and operates a family of award-winning Web sites including BloodHorse.com, TheHorse.com, StallionRegister.com, ExclusivelyEquine.com, the official store of Blood-Horse Publications, and TrueNicks.com.